Personal Tutors travel either to Student’s home, libraries or schools and conduct tutoring session on a one-to-one basis. The daily activities that can be seen on a professional Personal Tutor Resume include – preparing tutoring materials, scheduling tutoring appointments with the student or with their parents; recommending textbooks or software or equipment to complement tutoring; monitoring student performance, reviewing class material, assisting students with academic tasks, maintaining a detailed record of student performance, conducting workshops, and implementing tutoring plans for students. Those interested in this career should be able to demonstrate these skills in the portfolio – teaching experience, patience, strong command over the subject they are tutoring, record keeping skills, the ability to travel, and an encouraging attitude. They should even have the ability to identify the weakness of the student and be able to groom them in that area. A Bachelor’s degree is the common qualification that is seen on most of the resumes. Summary : 11+ years of experience as a Personal Tutor is seeking to obtain a position in education where I can utilize my mathematical and educational abilities to aid all students, both those to whom math comes naturally and those to whom it is a struggle, in achieving their educational goals. Skills : Microsoft Office, CAD, Calculus, Tutoring, Math, Typing, Communications, Phones, Chemistry, And Reading. Tutoring 10 – 20 hours weekly as a private contractor for a tutor. com and Wyzant.com, as well as independently. Providing assistance in elementary math – calculus ii, statistics, biostatistics, elementary-high school English, social studies, ap biology, gt chemistry, career help, and finance. Teaching fifth-grade mathematics, algebra I and geometry to homeschool students. Developing a complete curriculum with daily assignments and instructional goals for fifth and ninth grade students. Providing loving care for our two sons, balanced the family budget, and juggled demands of part-time work, home maintenance, groceries, and meal planning and preparation. Enabling two middle school English students to move from standard English to get English in two years. Supported several other students to move up one level in math within one year of assistance and succeed in the advanced level. Assisting many students in successfully completing challenging college math and business courses. Proofreading and helping students revise over one hundred essays covering almost every subject area. Earning nearly perfect ratings from in-person students and was rated one of the best tutors available for wyzant.com, tutor.com, and a thumbtack.com. Ability to teach any core academic subject from kindergarten through grade 12, as well as math through calculus ii and statistics. Superb time management and human resources management. Able to balance 2 children, a babysitter, and the clients’ needs and schedules. 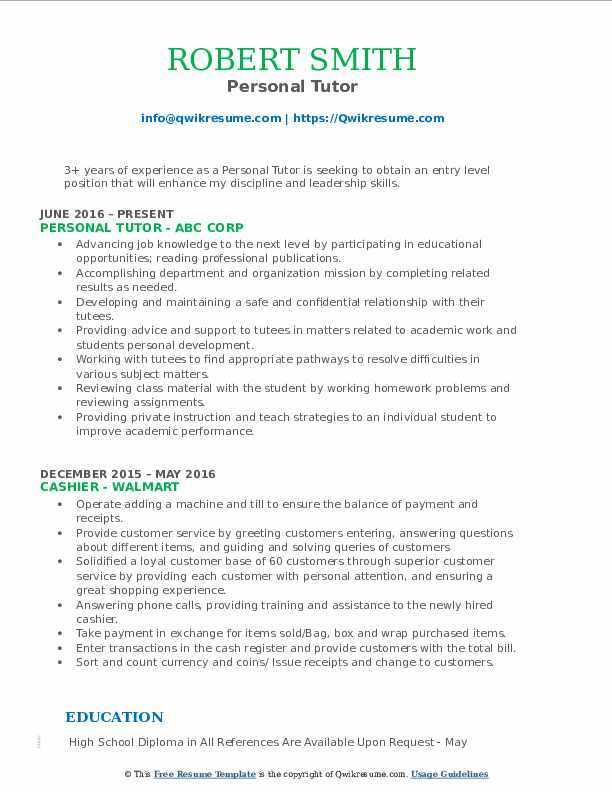 Headline : 6+ years of experience as a Personal Tutor is now looking to acquire a position in a fast-paced retail establishment that would allow me to use my knowledge of sales acumen, merchandising and customer service. Skills : Calculus, Tutoring, Math, Typing, Communications, Phones, Chemistry, Reading, And MS Office. Understand how people learn and help them to enroot skills necessary for functioning in a learning environment. Collaborating with students, and their family, to assess their individual needs. Monitoring the students learning through observation and documentation; engaging them with reflective listening, and encouraging with positive reinforcement. Conferring with other teachers, appropriated various educational materials, and used community resources that would contribute to the on-going learning process. Creating an organized and consistent learning environment. Prepare personalized lessons to better assist students and their. Preparing activities to engage students interest and improve understanding of concepts. Working with parents to develop learning goals and improvement plans, focusing on special education students. 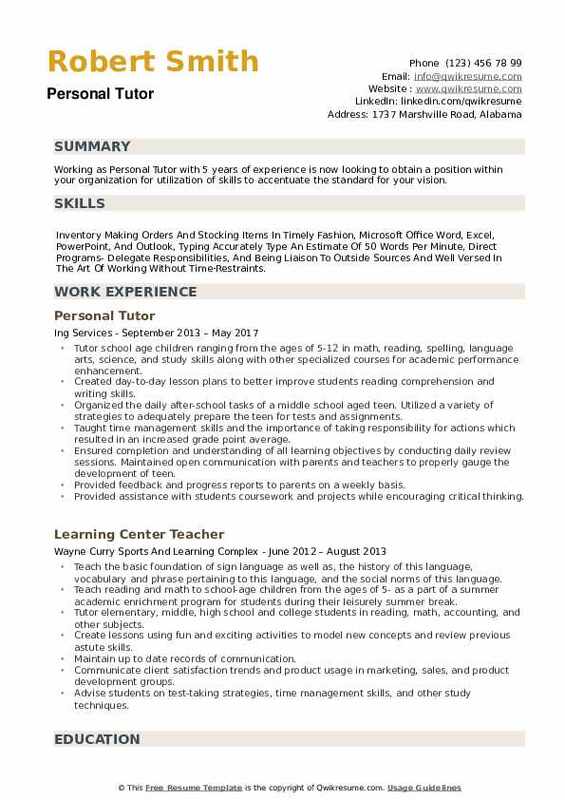 Objective : 3+ years of experience as a Personal Tutor. A focused individual enthusiastic about providing high-quality service to individuals in need throughout our community. I am a highly motivated professional with many years of useful experience and the proven ability to find solutions under any stressful situation. I can also learn new ideas and concepts in order to fulfill any clients or employers needs when the situation arises. Skills : Statistical Analysis, SAS, Numerical Analysis, Data Analysis, Financial Mathematics, Risk Analysis, MS Excel, And MS Word. Holding a weekly meeting with the parents of students to provide progress reports on their child's progress. Aids students with troubling coursework by using creative methods that best fit the student in math, science and other subjects as needed. Keeping in touch with teachers to make sure of getting help in the proper areas of study. Preparing lessons that go with current coursework to enhance understanding and learning of troubled subjects. Calculus, differential equations, general chemistry, organic chemistry, introductory. Giving tutoring assistance by request in the following subjects: high school algebra. Making student reports that profiled all their progress and made note of their weaknesses as well. Summary : 7+ years of experience as a Personal Tutor is seeking to obtain a position as an elementary school teacher where I can engage a diverse set of learners utilizing differentiated instruction, creating an environment that encourages student involvement and real-world application. Skills : Assembly, Assembly Language, C, Debug, Excel, Microsoft Office Suite, PHP, MySQL, Graphics Design, Linux, And Windows. Keeping rigorously organized documentation of student availabilities, student progress, areas of growth and lesson planning. Working with students in a wide range of competency levels, from freshman to graduate-level students. Aiding in thesis submission preparation to the English and chemistry departments. Gaining the vast majority of my tutor positions via positive reviews and word-of-mouth. Constructing lesson plans, quizzes and testing material for all students in all disciplines. Informing the students' parents of their children progress with tutoring. Meeting with students at the student center or their home to tutor them in English or reading. Objective : 3 years of experience as a Personal Tutor. I am self-motivated and reliable and have a passion for helping people understand concepts, especially those having to do with math and logic, by exploring and explaining them in more depth. 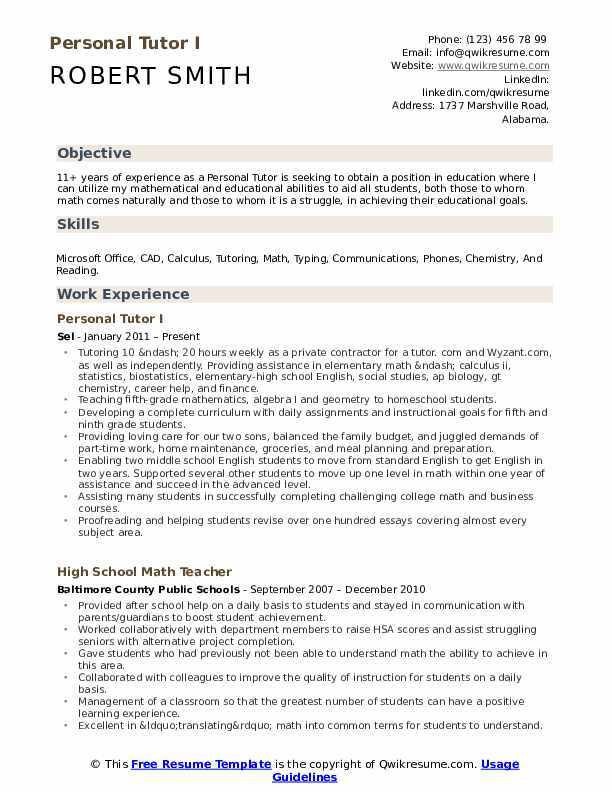 Skills : Math, Tutoring, Microsoft Office Suite, PHP, MySQL, Graphics Design, Linux, Windows, And Apple. Determined where students weaknesses are and created a study plan to help them advance. Worked with university students in one-on-one and online situations to ensure a better understanding of a subject. Previously tutored in college algebra, university physics, university chemistry, calculus, and engineering statics. Explain math and engineering concepts in simple terms. Tutor beginner, intermediate and senior level engineering courses. Tutor elementary, middle, high school and college students in reading, math, accounting, and other subjects. Advise students on test-taking strategies, time management skills, and other study techniques. Objective : 4 years of experience as a Personal Tutor. 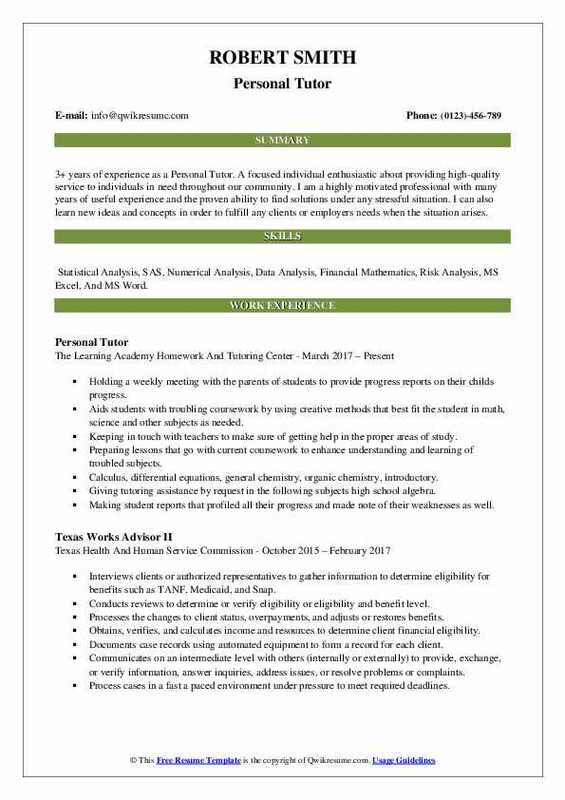 I am interested in a career with Statistical Analysis, Financial Analysis, and Risk Management. My long-term goal is to be a fully licensed Actuary. 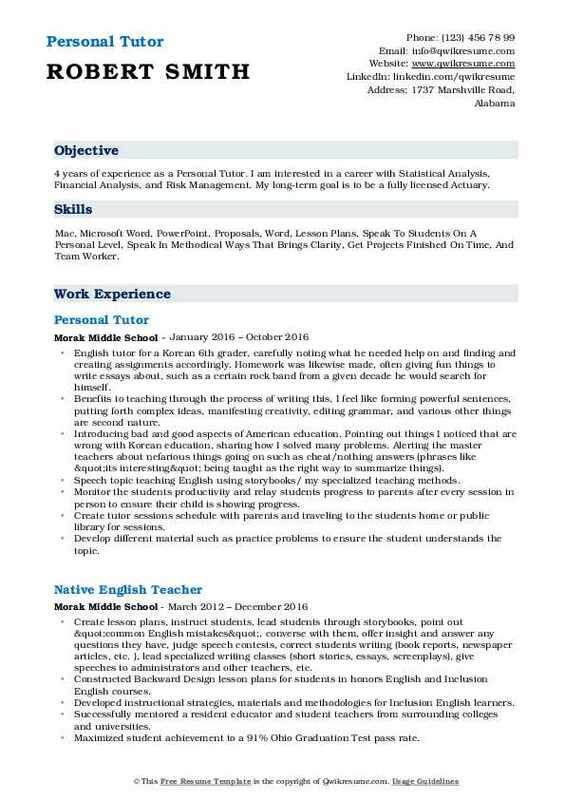 Skills : Mac, Microsoft Word, PowerPoint, Proposals, Word, Lesson Plans, Speak To Students On A Personal Level, Speak In Methodical Ways That Brings Clarity, Get Projects Finished On Time, And Team Worker. English tutor for a Korean 6th grader, carefully noting what he needed help on and finding and creating assignments accordingly. Homework was likewise made, often giving fun things to write essays about, such as a certain rock band from a given decade he would search for himself. Benefits to teaching: through the process of writing this, I feel like forming powerful sentences, putting forth complex ideas, manifesting creativity, editing grammar, and various other things are second nature. Introducing bad and good aspects of American education. Pointing out things I noticed that are wrong with Korean education, sharing how I solved many problems. Alerting the master teachers about nefarious things going on such as cheat/nothing answers (phrases like "it's interesting" being taught as the right way to summarize things). Speech topic: teaching English using storybooks/ my specialized teaching methods. Monitor the students' productivity and relay students progress to parents after every session in person to ensure their child is showing progress. Create tutor sessions schedule with parents and traveling to the students home or public library for sessions. Develop different material such as practice problems to ensure the student understands the topic. 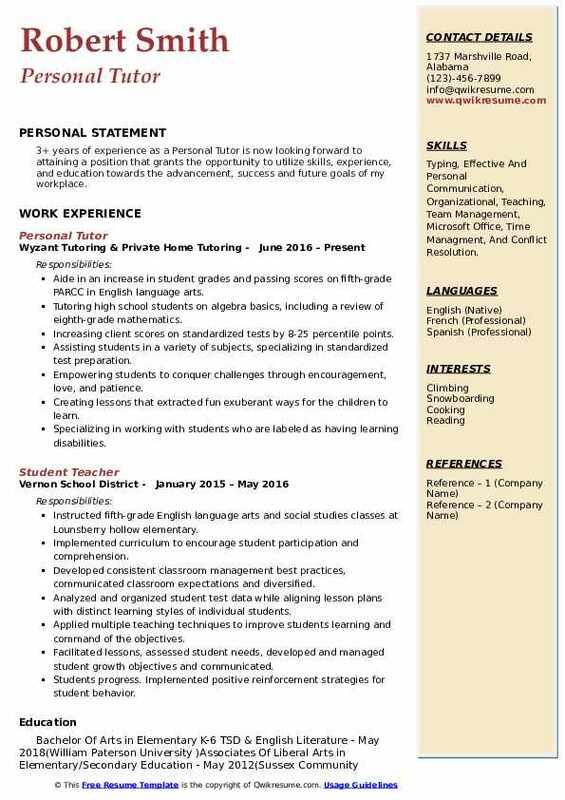 Objective : 3+ years of experience as a Personal Tutor is seeking to obtain an entry level position that will enhance my discipline and leadership skills. Skills : Public Speaking, Adaptability, Innovative And Critical Thinking, Experience With Leadership Roles, And Excellent Customer Service. Advancing job knowledge to the next level by participating in educational opportunities; reading professional publications. Accomplishing department and organization mission by completing related results as needed. Developing and maintaining a safe and confidential relationship with their tutees. Providing advice and support to tutees in matters related to academic work and students personal development. Working with tutees to find appropriate pathways to resolve difficulties in various subject matters. Reviewing class material with the student by working homework problems and reviewing assignments. Providing private instruction and teach strategies to an individual student to improve academic performance. 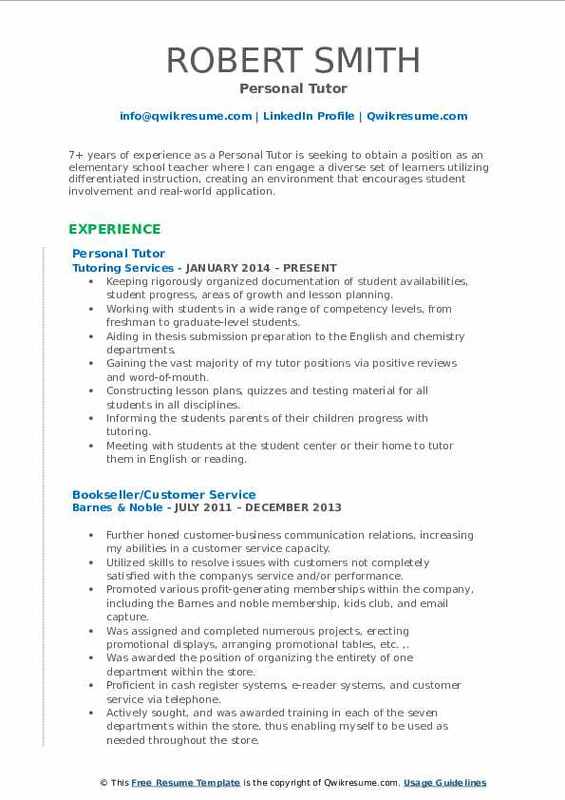 Objective : 3+ years of experience as a Personal Tutor. My objective is to procure employment with Med Aesthetics Group as a copywriter. Skills : Photoshop, CMS, Indesign, Leadership Training, Organizational Development, Organizational, Excel, And Microsoft Office. Assisting young children with their educational goals, tutoring them in becoming proficient in English, and also helping students become proficient in reading at their grade level. Daily homework assignments, special projects, note taking skills, preparing for exams, maintaining. Working with a 5th-grade student who was struggling in all academic areas. Assisting him with completing homework. Providing one-on-one educational assistance to elementary and secondary school students or to adults. As an elementary school tutor, you may help children (grades 1 – 8) improve their skills in reading, writing or math. As a secondary school tutor, you may help students (grades 9 – 12) with English, history, science, math, French or other subjects. Tutors for adults may teach literacy, English or other languages, or other subjects. Spend 3 days per week serving as a personal tutor to young children assisting with linguistics. Finding the unit structure in a factor ring of a quadratic number field - completed as part of. Developing individualized study plans, accommodating student learning styles and goals. Objective : 3+ years of experience as a Personal Tutor is now looking forward to attaining a position that grants the opportunity to utilize skills, experience, and education towards the advancement, success and future goals of my workplace. 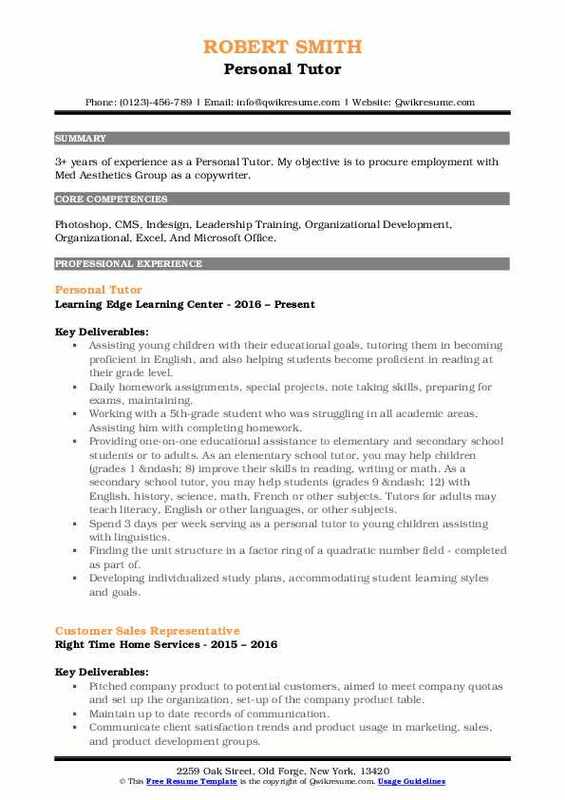 Skills : Typing, Effective And Personal Communication, Organizational, Teaching, Team Management, Microsoft Office, Time Managment, And Conflict Resolution. Aide in an increase in student grades and passing scores on fifth-grade PARCC in English language arts. Tutoring high school students on algebra basics, including a review of eighth-grade mathematics. Increasing client scores on standardized tests by 8-25 percentile points. Assisting students in a variety of subjects, specializing in standardized test preparation. Empowering students to conquer challenges through encouragement, love, and patience. Creating lessons that extracted fun exuberant ways for the children to learn. Specializing in working with students who are labeled as having learning disabilities. Helping the student identify the barriers to their success as well as provide pro-active support to stay on track. 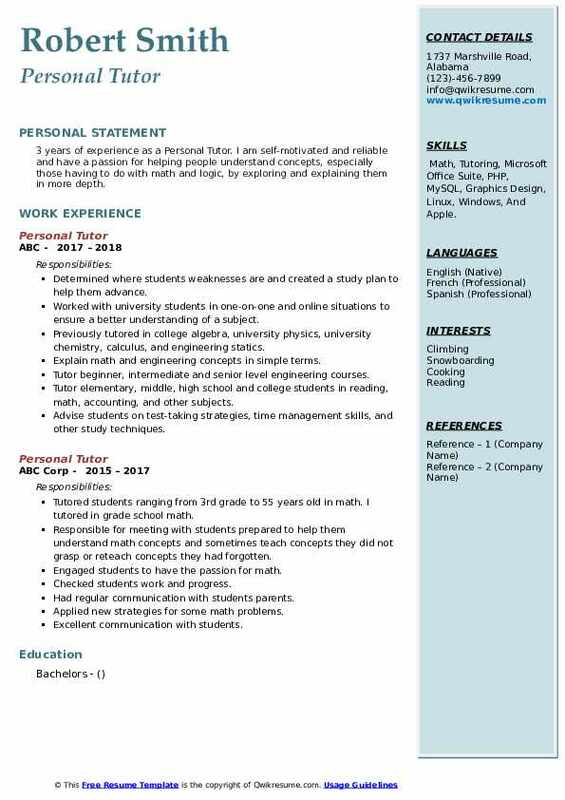 Headline : Working as Personal Tutor with 5 years of experience is now looking to obtain a position within your organization for utilization of skills to accentuate the standard for your vision. 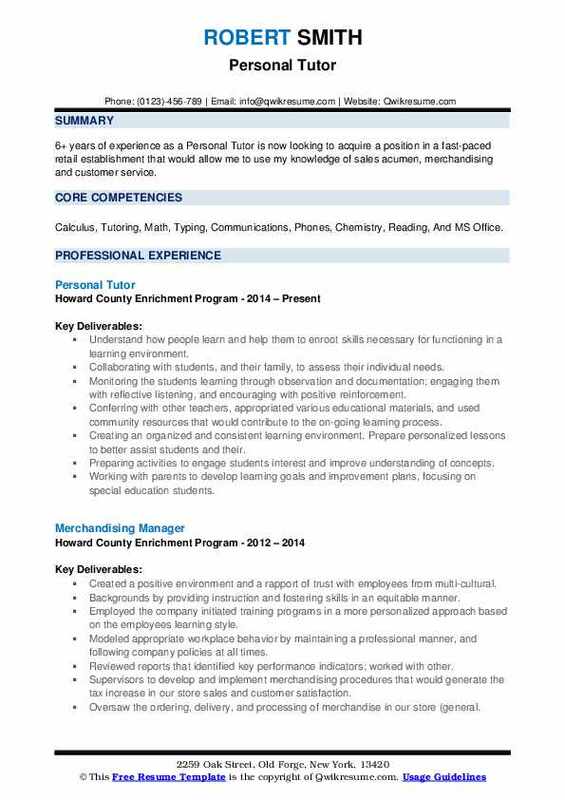 Skills : Inventory Making Orders And Stocking Items In Timely Fashion, Microsoft Office Word, Excel, PowerPoint, And Outlook, Typing Accurately Type An Estimate Of 50 Words Per Minute, Direct Programs- Delegate Responsibilities, And Being Liaison To Outside Sources And Well Versed In The Art Of Working Without Time Restraints. Tutor school age children ranging from the ages of 5-12 in math, reading, spelling, language arts, science, and study skills along with other specialized courses for academic performance enhancement. Created day-to-day lesson plans to better improve students reading comprehension and writing skills. Organized the daily after-school tasks of a middle school aged teen. Utilized a variety of strategies to adequately prepare the teen for tests and assignments. Taught time management skills and the importance of taking responsibility for actions which resulted in an increased grade point average. Ensured completion and understanding of all learning objectives by conducting daily review sessions. Maintained open communication with parents and teachers to properly gauge the development of teen. Provided feedback and progress reports to parents on a weekly basis. Provided assistance with students coursework and projects while encouraging critical thinking.